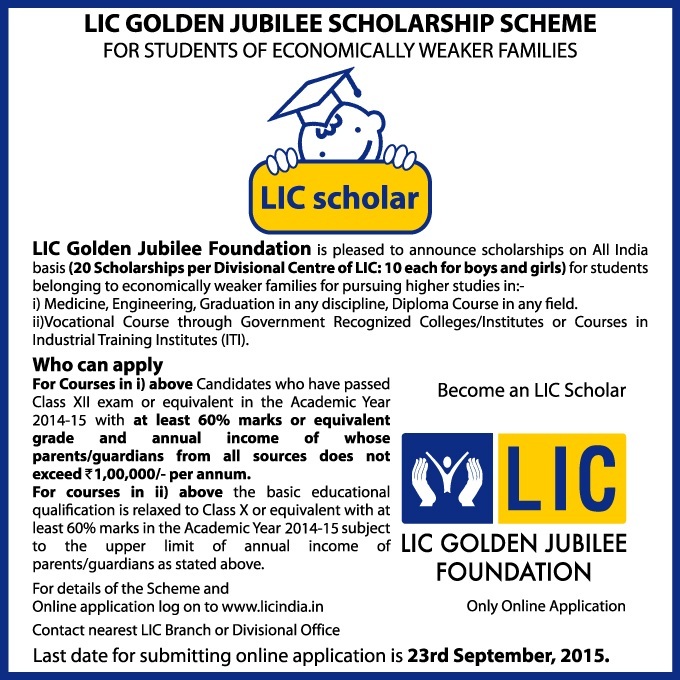 Subject : LIC GOLDEN JUBILEE SCHOLARSHIP FOR STUDENTS BELONGING TO THE ECONOMICALLY WEAKER FAMILIES FOR PURSUING HIGHER STUDIES. ELIGIBILITY : Students who have passed Class XII exam or its equivalent in the Academic Year 2015-16 and are interested to pursue higher education in the field of i) Medicine, Engineering, Graduation in any discipline, Diploma Course in any field or other equivalent courses. ii) Vocational Courses through Government recognized Colleges/Institutes or courses in Industrial Training Institutes (ITI). i) The Candidates who have passed Class XII exam or equivalent in the Academic year 2014-15 with at least 60% marks or equivalent grade and annual income of whose parents/guardian from all sources does not exceed ` 1,00,000/- per annum. ii) above The basic educational qualification is relaxed to Class X or equivalent with at least 60% marks in the Academic year 2014-15 subject to income ceiling of parents/guardians. The last date of applying for Golden Jubilee Scholarship: 23/09/2015. Last date for submitting online application for GJF Scholarship: 23/09/2015.